Beginning July 10, U.S. Geological Survey scientists plan to conduct fieldwork along a flood-impacted stretch of New York’s Lake Ontario shoreline, using unmanned aerial systems (also known as drones), pressure sensors that measure water elevation and special water-elevation gages designed for rapid set-up. The fieldwork, supported by the state of New York and the Federal Emergency Management Agency, is designed to gather up-to-date information to help emergency managers track and respond to historic levels of flooding, and to collect new scientific data about coastal processes affecting the lake’s shoreline. High waters on Lake Ontario and the St. Lawrence River have damaged hundreds of residential and commercial properties along the shoreline, leading New York Gov. Andrew Cuomo to declare a state of emergency in six counties around the lake. The flooding was caused by heavy rains that fell on the Lake Ontario basin, a 32,000-square-mile area that stretches between the U.S. and Canada, in April and May. The Army Corps of Engineers estimated that roughly four trillion gallons of rain water has flowed into Lake Ontario. The lake is now more than 30 inches above normal, the highest it has been since at least the 1950s. Hydrologists from the USGS’ New York Water Science Center will install 14 water-elevation measuring devices along a 150-mile stretch of shoreline stretching south of Watertown, New York. The gear includes eight rapid deployment gauges, which measure water elevation using radar, and six water-pressure sensors, which are anchored below the surface and use the amount of water pressure on the device as a way to calculate water elevation. Information from these sensors will supplement data from the National Oceanic and Atmospheric Administration’s existing lake-elevation network. The scientists will also measure and record high water marks—the telltale lines left by seeds, weeds and leaves on buildings, bridges, trees and bluffs. 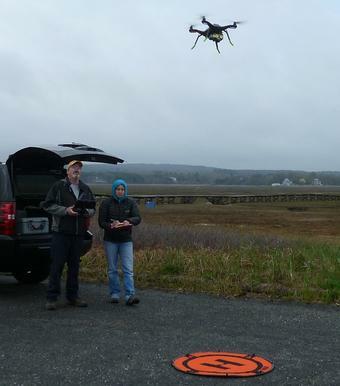 Working with the New York-based teams, crews from the Woods Hole, Massachusetts center will fly an unmanned quadcopter about the size of a pizza box over at least two shoreline areas: the Braddock Bay Wildlife Management Area near the town of Greece, New York; and Sodus Bay, between Rochester and Syracuse, New York. Flying at around 160 to 300 feet above ground level, the quadcopter will take hundreds of photographs of individual shoreline features. Before each quadcopter overflight, field crews will deploy black and white targets as reference points in the photographs. USGS experts will then use computer “structure from motion” software, similar to that used in some 3D gaming apps, to analyze stereo views in those photographs as a basis for detailed shoreline mapping. That information will help the New York Department of Environmental Conservation and the New York Department of State understand coastal changes taking place in the wake of this flood, and plan for any future flooding, Breault and Thieler said.